My husband, Todd, and I recently enjoyed a night out in Bellevue and had dinner at John Howie Steak. This was our second time to this restaurant, and this time I came prepared with camera in hand because I wanted to share with you what I already knew would be a wonderful dining experience. Let me take you on a culinary tour to a world class steakhouse. For me, knowing something about the restaurant, its history, its chef, its owner, makes the dining experience all the more enjoyable. So if you’d like to have some interesting insights into this restaurant and its chef-owner, keep reading. Or if you’d rather, just skip down to the FOOD! (But don’t forget the giveway sandwiched in between). 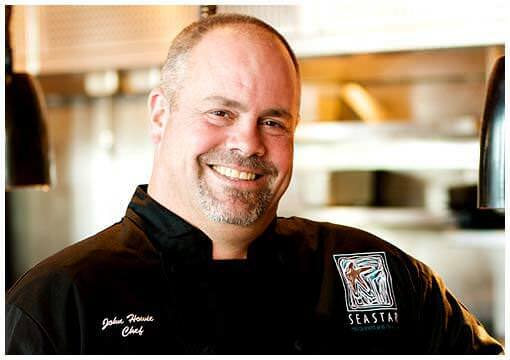 Let me take a moment to introduce you to John Howie: Husband, father, grandfather, chef, restaurateur. Chef Howie divides his time between his restaurants and I had the opportunity to meet him the first time I visited John Howie Steak. I’ve since learned more about him, his restaurants, his philanthropic efforts, and his cookbooks. There is a good chance you’ve met him on television. He has appeared on Martha Stewart Living, CBS Early Morning Show, Food Network’s “Best Of,” and the Food Channel’s United Tastes of America, Rick Browne’s Barbecue America, the Cooking Channel and Food Network. He has also been featured on Wall Street Journal, the New York Times, and appears on Seattle’s local TV and radio stations. In 2013, Chef Howie was named as a semi-finalist for the James Beard Award – Outstanding Restaurateur. Chef Howie has a “never say no to charitable giving” policy and since 2002 has donated over $4,500,000 in time, products and gift certificates to 750 non-profits. Something that touched me, this past November, for the 11th consecutive year, Seastar opened its doors in the Thanksgiving tradition of serving a full three course meal to over 600 people in need. Seastar staff, family members and friends acted as servers, cooks and dishwashers. Another fact I recently learned about Chef Howie is that he is considered the foremost expert on plank cooking, the Northwest Native American method of roasting fish, meats and poultry on cedar planks, and has authored two cookbooks on the subject. Cedar and alder planks, along with spice rubs, cookbooks and everything you need to know about plank cooking can be purchased directly from his website dedicated to the subject. His latest cookbook and our giveaway prize, “Passion & Palate”, is filled with stories, features over 240 recipes with beautiful photography and is endorsed by several highly regarded chefs. The book also features wine recommendations for each recipe. This cookbook is not for the novice cook, but if you are serious about fine cooking you’ll thoroughly enjoy it. You can look forward to such recipes as Dungeness Crab Salad with Avocado and Grapefruit, Potato Lasagna with Caramelized Onions, Thai Beef with Grapes, Crab and Corn Bisque, Texas-style Steak Chili, Hot and Sour Thai Shrimp Soup, Halibut With Chanterelle Succotash and Bacon, Ancho Chili-rubbed Salmon with Sweet Chili Hollandaise, Lobster Macaroni and Cheese, Pineapple Upside-down Cheesecakes, Lemon Poppy Seed Coookies, White Chocolate Irish Cream Truffles, Strawberry Shortcake with Orange Cream, and Molten Turtle Cakes. 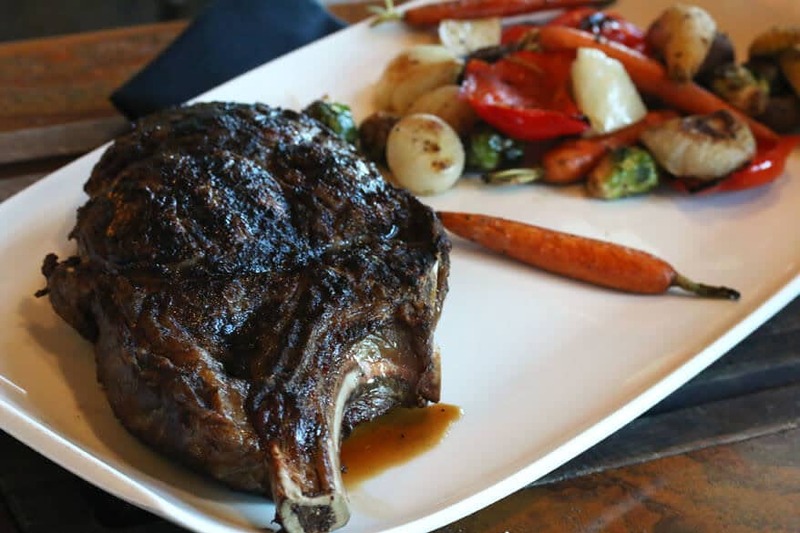 Leave a comment on this post sharing which of the dishes I’ve shared from John Howie Steak you’d most like to try and you’ll automatically be entered to win! This giveaway ends June 20th at 12pm PST at which time one winner will be randomly chosen and notified via email. The winner must respond within 48 hours or another winner will be selected. Participants must live within the U.S. or Canada. 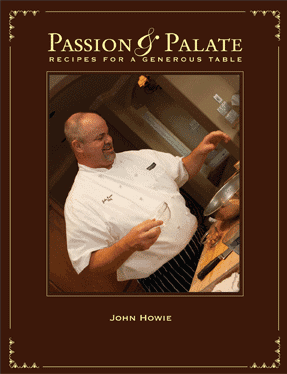 On a side note, “Passion & Palate” has contributed over $56,000 in charitable efforts since being published and John Howie is now inviting guests to help choose the recipient of that charity. This cookbook can be purchased at any restaurant location or purchased online and $5 from each book purchase goes to your choice of three charities. And now, LET’S TALK STEAK! 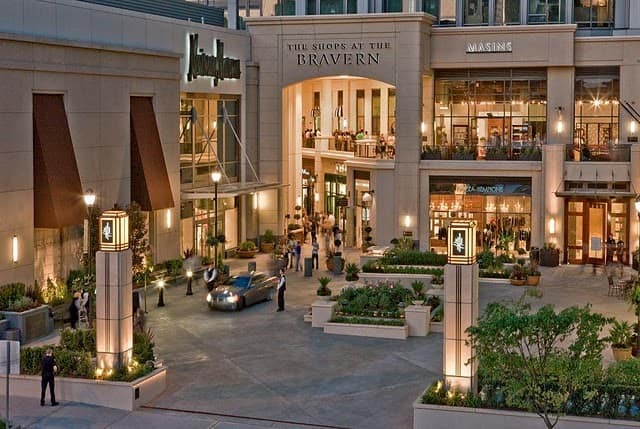 John Howie is located in downtown Bellevue within The Bravern. The complex has its own parking garage and you can get your parking ticket validated in the restaurant. 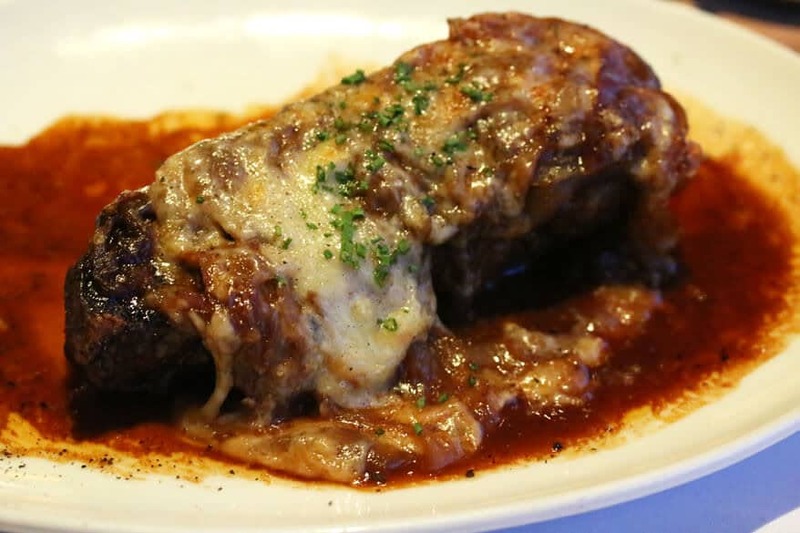 They say that first impressions count, and John Howie Steak is no exception. The stunning location, the sign welcoming you to “Bellevue’s Finest Steakhouse,” and the thing you’ll notice first as you walk in the restaurant: A towering case displaying the world’s finest cuts of beef aglow in the dimly lit foyer. John Howie Steak offers six tiers of the world’s best steaks from their 28 day, 35 day and 42 day Custom Aged USDA Prime Beef. They also feature American Wagyu from Boise, Idaho, 100% fullblood Australian Wagyu from Brisbane, Australia, and “A5” 100% Japanese Wagyu from Kyushu, Japan. I understand that Executive Chef Mark Hipkiss is the culinary artist behind many of the wonderful dishes we enjoyed that evening. The son of an English butcher, he also knows how to handle and prepare a great piece of steak. We were seated at a window table just in time to catch a view of a cute family of geese crossing the grass below. Our waiter, Eric, told us he had ordered up that perfectly timed performance just for us. We were sure to reflect that in our tip. We enjoyed exceptional service from all the staff, including Eric. His pride in John Howie Steak was evident and the passion and enthusiasm with which he spoke about the restaurant and various dishes made me want to sample the entire menu. His recommendations were spot on. The staff is exceedingly knowledgeable. Ask them about anything related to the restaurant or menu, including the in’s and out’s of their specialty salts, wine, cuts of beef, etc., and they can answer all of your questions. John Howie Steak enjoys an award-winning wine list featuring bottles from around the world. But even for non-alcohol drinkers like us, they have a fantastic selection. 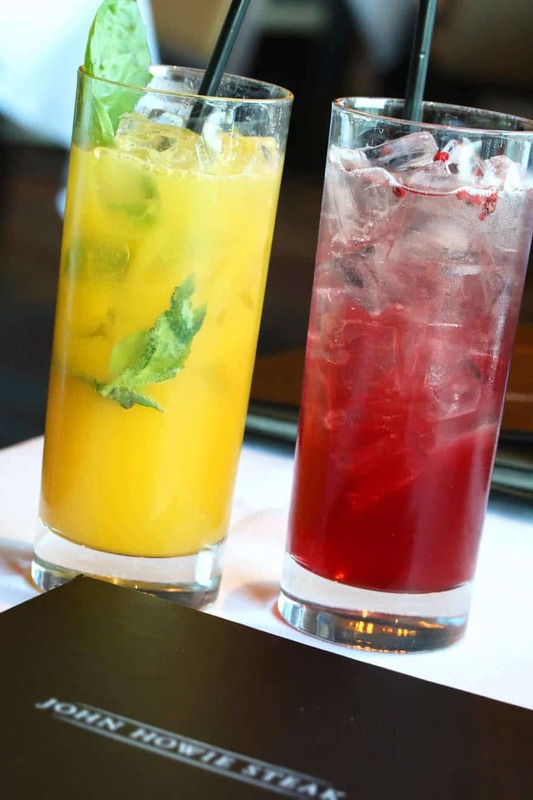 We chose two of their “mocktails”: Mango Basil Crush, made with mango puree, lemon juice, simple syrup, muddled basil leaves, club soda and garnished with basil leaves and lemon peel. And the Grapefruit Pomegranate Elixir, made with grapefruit juice, pomegranate juice, simple syrup, club soda, and garnished with pink peppercorns. Neither were too sweet and both were refreshing. Of the two, the Grapefruit Pomegranate Elixir was our favorite. As we sipped our mocktails our waiter brought us a basket of John Howie Steaks’ signature breads, all made in house. We do have one major complaint about the bread: It’s so delicious that you want to eat it all, thus sabotaging your appetite for remainder of the meal, and resisting the urge to eat it all is just plain torture. 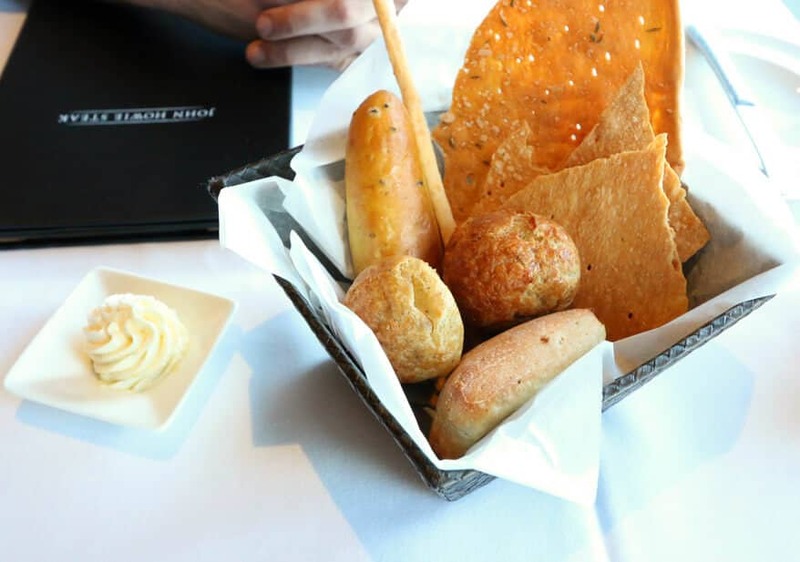 The basket included rosemary and sea salt flatbread, ciabatta, Beecher’s Flagship Reserve white cheddar grissini, pretzel bread with Hawaiian black lava sea salt, and parmesan rolls. The parmesan rolls are to die for. And I’ll admit, I threw caution to the wind and asked for a couple extra. Todd’s favorite: The pretzel bread with Hawaiian black lava sea salt. The entire selection was incredible. Next came the appetizers. Having fallen in love with it the last time we were there, I ordered the Tempura Fried Kurobuta Bacon served with maple sambal dipping sauce. Kurobuta bacon comes from Berkshire pigs, a very rare breed of pig that originated in England. I probed into this a little and found out that there is an American Berkshire Association that was established in 1875 which gives pedigrees only to pigs directly imported from established English herds. What makes Berkshire pigs special? They’re heavily marbled and are prized for their exceptional juiciness, tenderness and flavor. 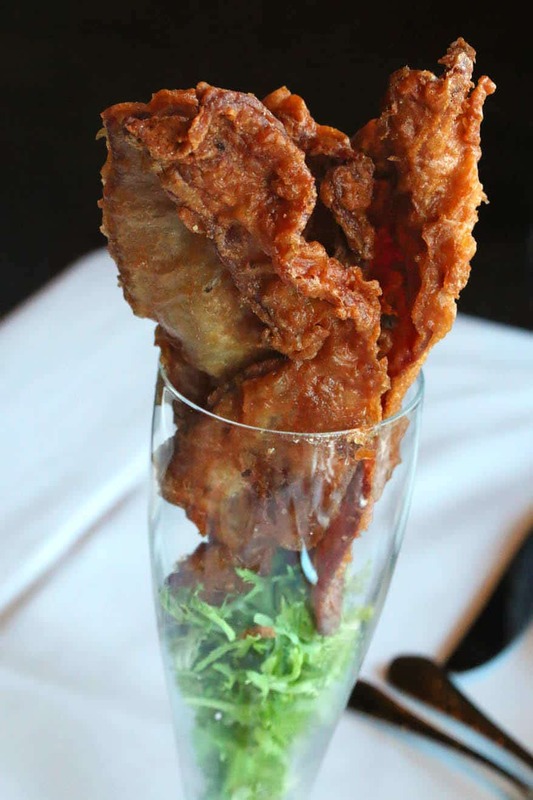 And John Howie Steak has taken strips of Kurobuta bacon, dipped them in tempura batter, and fried them to crispy perfection. And then dipped in that fabulous sweet-spicy sauce….Really, I have no words. I’ll let the pictures do the talking. After tasting the bacon Todd realized just how lucky he was that I was willing to share. While I savored every last morsel of bacon, Todd enjoyed his 1/2 dozen oysters on the 1/2 shell which came accompanied by classic cocktail sauce, champagne mignonette granita, and fresh lemon. 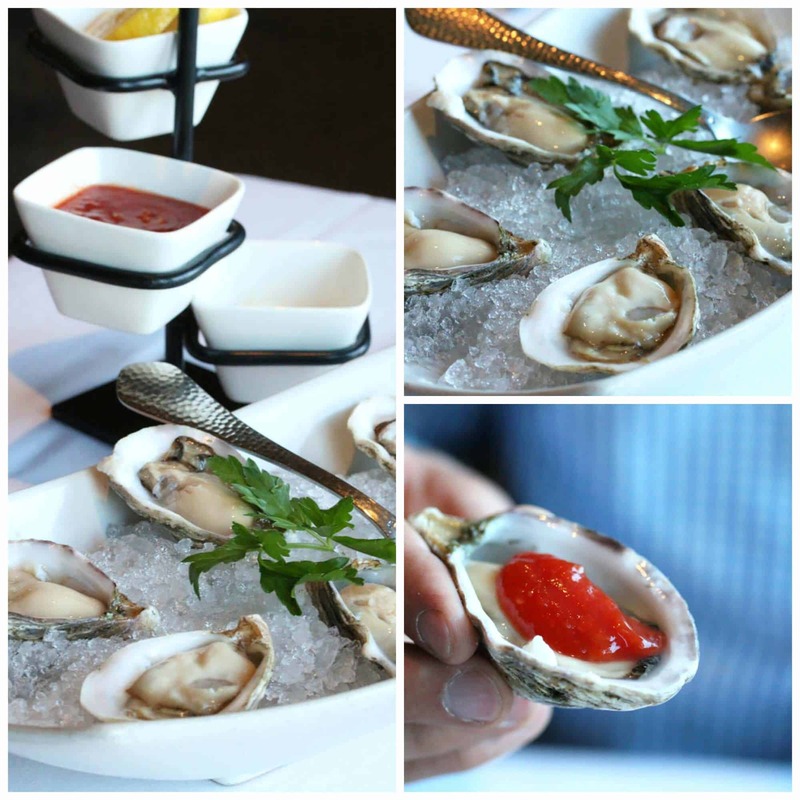 These particular oysters were kusshi oysters, popular on the West coast and known for their small size and ultra-clean flavor. Service at John Howie Steak is expeditious and we no sooner finished our bacon and oysters than our sides and steaks made their way to our table. All sides are portioned for two and we had plenty to share. 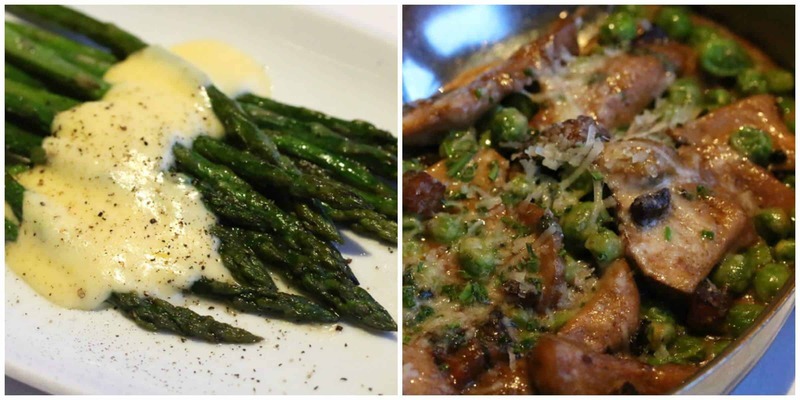 We enjoyed some asparagus spears with brown butter and a luscious Meyer lemon hollandaise. Not a drop was left. A favorite of ours was the Porcini Mushrooms with Pancetta and Sweet Peas with white wine, butter cream and topped with cheese. No one ingredient overpowered the other and the delicate interplay of flavors was delicious. We also enjoyed the Yukon Gold Potato Cakes. Few things beat the down home flavor of crispy fried potatoes and here they’re given a touch of class with crème fraîche, chives and American caviar. A dish that completely took me off-guard was the Roasted Cauliflower with Green Olive Vinaigrette & Pistachio Nuts. I ordered it partially out of curiosity but also because knowing dessert was still coming I wanted to go easy on the carbs. I realize how it must sound to say that I was blown away by cauliflower. But that’s just the beauty of it. John Howie Steak has transformed this white cruciferous vegetable into something magical. The vinaigrette, packed with pistachio nuts, green olives, pimentos, and capers was so good it was the first thing I reached for in our to-go bag the next day. My husband laughed at me when he saw me sitting on the sofa clutching my little leftover box of cauliflower and savoring it with a swooning expression. Seriously, I’ve been half tempted to call up Executive Chef Hipkiss and beg ask for the recipe. While we were savoring our food the waiter brought in the biggest ribeye steak we’ve ever seen for the table across from us. 64 ounces. The picture doesn’t reflect just how enormous this steak was, but it was seriously the size of a football. Check it out! And speaking of steaks, let’s discuss ours, shall we? With the steak they brought us three tiny dishes featuring three kinds of salt: Fleur de sel, Australian pink Murray River salt, and Hawaiian black lava sea salt. The Hawaiian black lava salt is amazing and I’ve since ordered some. In case you’re interested, I ordered it here. 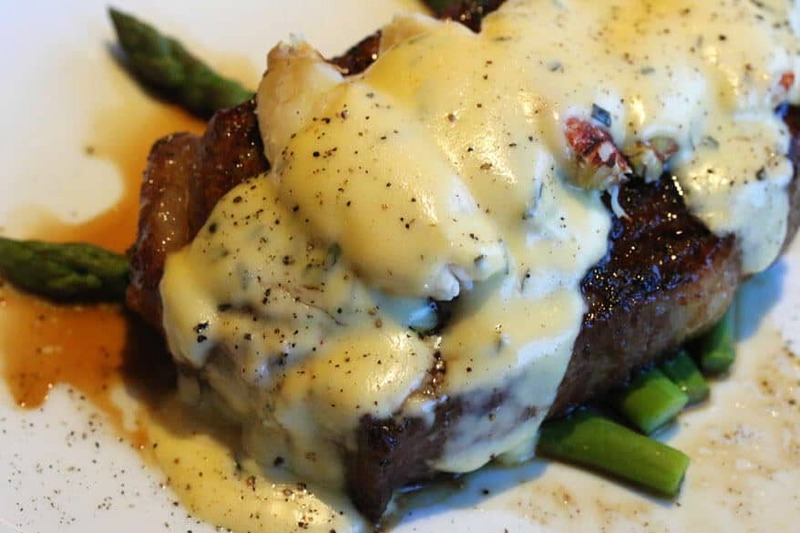 Todd ordered the 42 day custom-aged ribeye steak and had it served “Oscar Style” – with dungeness crab, asparagus spears and béarnaise sauce. A masterpiece. I prefer a little leaner cut of beef and ordered the 35 day custom-aged 14 ounce New York Strip. I’m also squeamish about any pink and always order my steaks well done. I had it prepared French Onion Style, with caramelized onions, veal stock, brandy, Gruyère and Parmigiano Reggiano cheeses. Superb. Yes, my jaw dropped when it was set in front of me. Something fresh sounded good, so Todd ordered the Meyer Lemon Pie. I was in a chocolate mood and ordered the Flourless Semi-sweet Chocolate Volcano Cake. Eric informed us that both were excellent choices but practically insisted we try the Boston Cream Pie. Not knowing which of the other two desserts to ax, we really threw caution to the wind and tried all three! We were so appreciative of Eric’s passionate recommendation because, of the three, the Boston Cream Pie was our favorite. Let’s take a closer look at the desserts. The Flourless Semi-sweet Chocolate Volcano Cake was quite an impressive thing to behold. 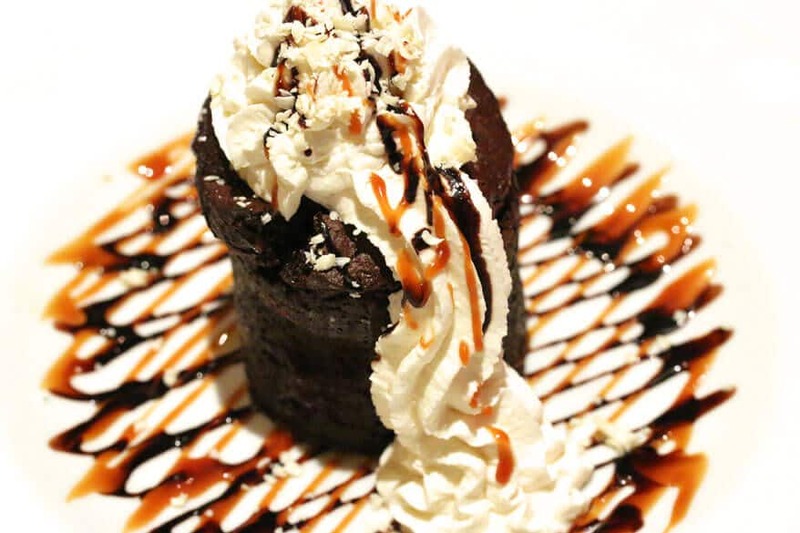 A towering chocolate cake with a soft and moist interior with warm caramel, shaved white chocolate, and a fabulous display of vanilla crème spouting out of the “volcano” and running down it’s side onto the plate. Marvelous. 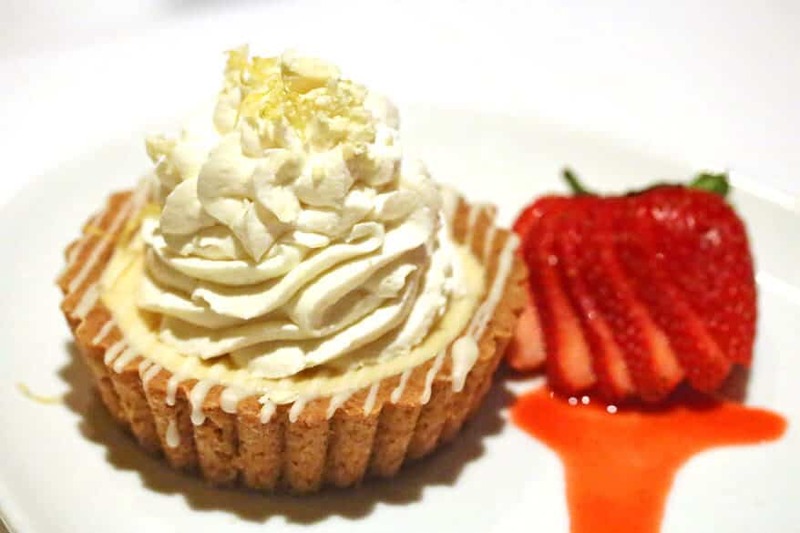 Then there was the Meyer Lemon Pie with a graham cracker crust, white chocolate drizzle, vanilla crème and strawberry coulis. I’m a big fan of Meyer lemons and this hit the spot. And the presentation was gorgeous. And then came the Boston Cream Pie. Ohhhh, that Boston Cream Pie. You’d never even guess that’s what it is to look at it. It looks more like a piece of modern art. A delicate layered sponge cake with crème anglaise and a rich chocolate ganache with a lace ladder made of white and dark chocolate propped up against it, beckoning you to make the ascension up it’s path of sweetness and to dive right in the cake! Eric told us about the development of this particular dessert. He said the chefs had been at work for 5 weeks to develop the perfect Boston Cream Pie. During this time while the dessert was under development the staff would eat all the scraps (I think I may have chosen the wrong profession). And then, at long last, the masterpiece was unveiled. And a masterpiece it was. We had quite a few leftovers which the staff arranged for us in a take-home bag. 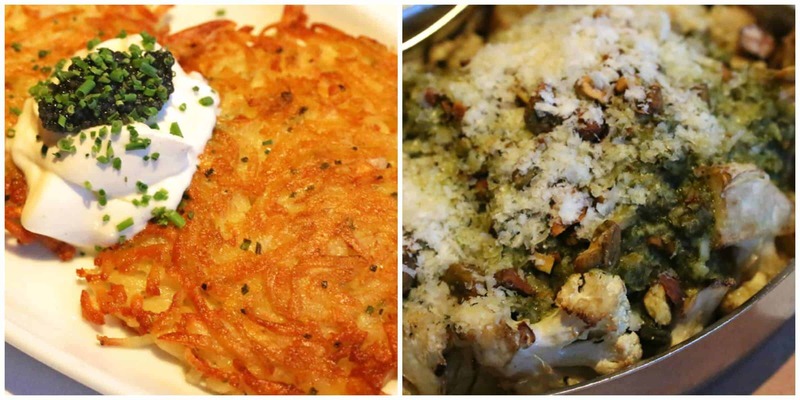 Let’s just say that leftovers have never tasted so good. When you go to John Howie Steak plan to be there for a while. Not because the service is slow, because it’s quite prompt, but because you’ll want to take your time savoring each bite and allowing your palate to fully absorb and appreciate the layers of flavors. In every dish the ingredients perform a careful balancing act. The flavors and textures complement each other perfectly and nothing is overbearing. Every ingredient is added intentionally, deliberately and each one comes through in its own right without diminishing the other. The attention to detail is truly remarkable. In dining at John Howie Steak it becomes readily apparent that John Howie’s #1 priority is customer satisfaction. “It’s all about the customer” holds true here. My 2 and 4 year old remind me of the childhood developmental phase of egocentrism, where you see everything as revolving around you. John Howie Steak allows you to receive that kind of indulgent pampering. For that one or two precious hours you spend there, you get to feel like the world – or at least the restaurant – revolves around you. And that’s okay. As long as reality kicks back in once you’ve left the restaurant. Couple that with exceptional food and you have an unforgettable evening. Disclosure: John Howie Steak provided us with a complimentary meal without any obligation to write a positive review. As always, all opinions are entirely my own and I only write about products and services that I personally like and use. WOW! This is such a gorgeous review. 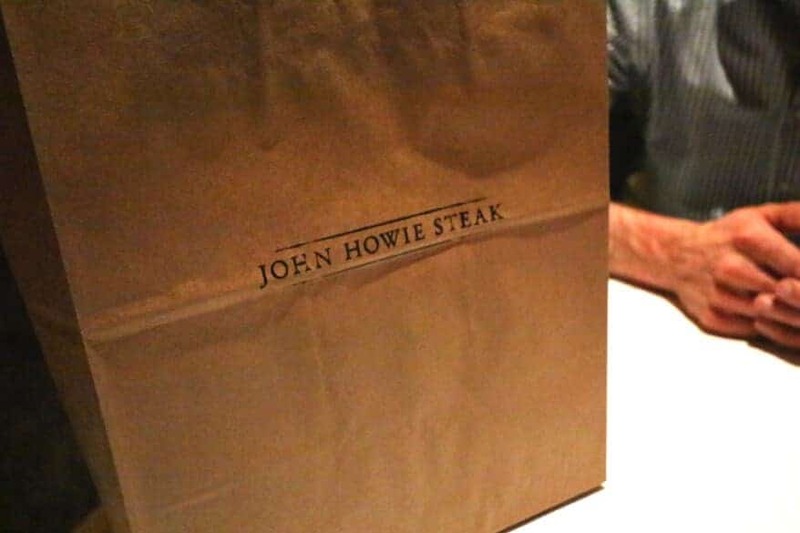 I’ve never been to John Howie Steak but have heard about it from friends. Thank you for sharing this. And I would love that cookbook. Which dish would I most like to try? ALL of them, of course! You sure had my eyes popping at that bacon though. LOVED this! I can only imagine how much work went into this. Thanks for sharing your experience. Those desserts all look incredible. I would love to try all three! Oh my goodness, this restaurant looks amazing! I want to try every single dish! Well, I’m not a fan of oysters, but everything else looks delicious. I really, really want that bacon! And please sign me up for the cookbook giveaway. The recipes in it sound amazing. Don’t think my mouth has ever watered so much reading a restaurant review. Excellent job on the article and photos. 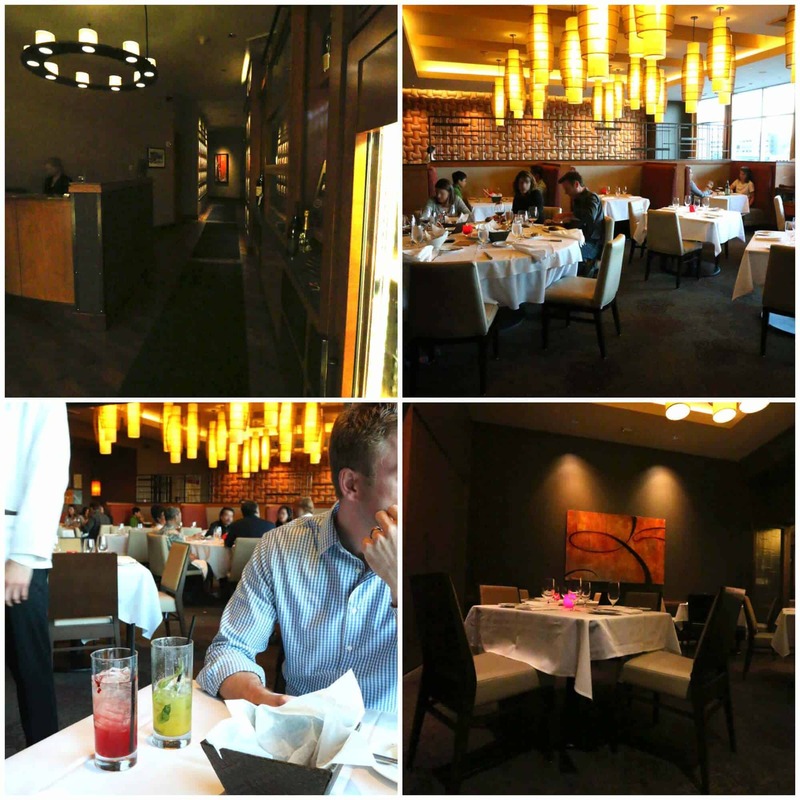 My husband and I went to John Howie Steak for our anniversary two years ago and LOVED it! I was so excited to see this review! John Howie’s cookbook looks wonderful. I would love to try the Porcini Mushrooms with Peas and Pancetta. Thanks! 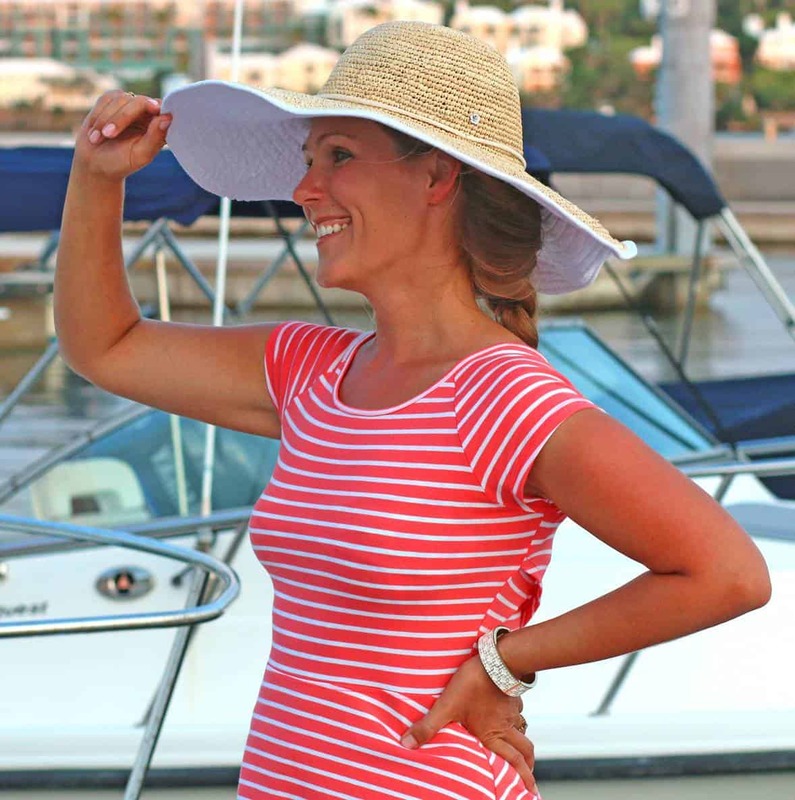 Such gorgeous pictures and really enjoyed reading your review. Would love to add that cookbook to my collection. Normally I wouldn’t express an interest in cauliflower but you’ve definitely piqued my interest. 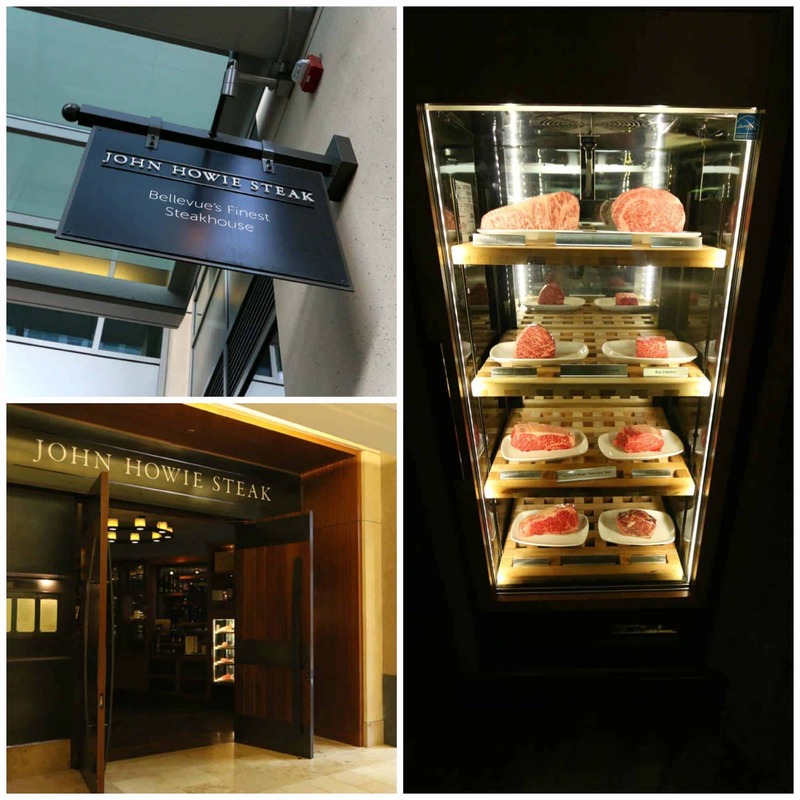 I am not a steak person at all, but I would not bat an eye in going to John Howie Steak! The bacon alone is a good enough reason, and your steak would be something even I would love! And the desserts? Holy cow…amazing! Great review, Kimberly! Can’t wait until I’m in Bellevue again! So, is this where you are planning on taking John and I when we come to visit?? I would love to try all the dishes you mentioned, but the flour less chocolate cake looks totally tempting. Your pictures really make all these foods come alive and I can taste them now. I can’t believe you want me to pick just one?!? It all looks divine – the asparagus, the bacon, the cookies (I adore lemon poppy seed anything!) the lobster mac & cheese, the Ancho Chili-rubbed Salmon with Sweet Chili Hollandaise and the list is topped with the Chef – could he be any cuter?!? ;) Thanks for giving me a new reason to travel to the Pacific NW! 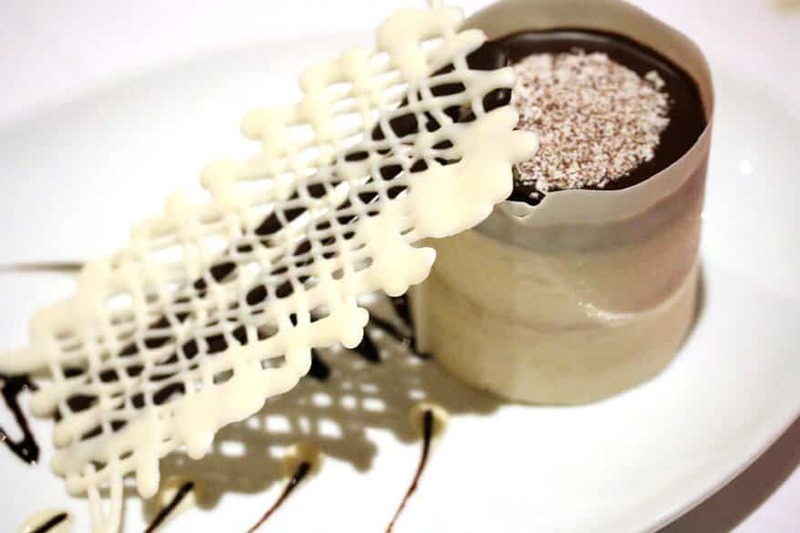 I’m not a meat eater, but your review in both your words and pictures allures me…I definitely would love to visit John Howie Steak restaurant and try some vegetarian dishes and the desserts! The Roasted Cauliflower with Green Olive Vinaigrette & Pistachio Nuts sounds amazing! I may have to go tonight!! What a wonderful review! Chef John is certainly very talented. The food looks fabulous. But, I am most moved by his charitable outreach. I ran a hot food program for the poor and homeless for 15 years in Kansas City, serving about 600 meals daily at lunch 5 days a week. So, I can really appreciate donations of time and product provided by the food providing community. The program, Kansas City Community Kitchen still exists. We also created a culinary arts training program for some of our guests, Culinary Cornerstones, similar to the one in Seattle following the leadership of Robert Egger of DC Central Kitchen (now at LA Kitchen). I would try the Lobster Macaroni and Cheese and the Flourless Semi-sweet Chocolate Volcano Cake. Love to cook and bake would try all the ones you shared. What a great review, but did you really eat all that food, I would have been stumped after the starters, well no you didn’t did you, seeing that huge doggy bag. You are very fortunate to have such a great restaurant in your locale. I am a displaced Seattleite, and oh how I miss the great food there now! I would most like to try the Dungeness crab salad…My mouth waters at the thought. Unfortunately I have terminal cancer, so the chances of my getting back to try it are very slim! I’d like to try the Roasted Cauliflower with Green Olive Vinaigrette & Pistachio Nuts. The 42 day custom-aged ribeye steak served “Oscar Style” – with dungeness crab, asparagus spears and béarnaise sauce sounds divine! And the Molten Turtle Cakes from the cookbook sound equally divine! I am a HUGE fan of veggie sides done right to complement the meat! My picks would be: Porcini Mushrooms with Pancetta and Sweet Peas, Roasted Cauliflower with Green Olive Vinaigrette and the Asparagus. OMGawd! You had me at “prime Juicy Lucy Burger”. I love exploring Seattle area restaurants – we visit frequently from Victoria. I will not miss this restaurant after reading your review, and will not deny an order of that beautiful Berkshire bacon. Gail, you will not be disappointed. 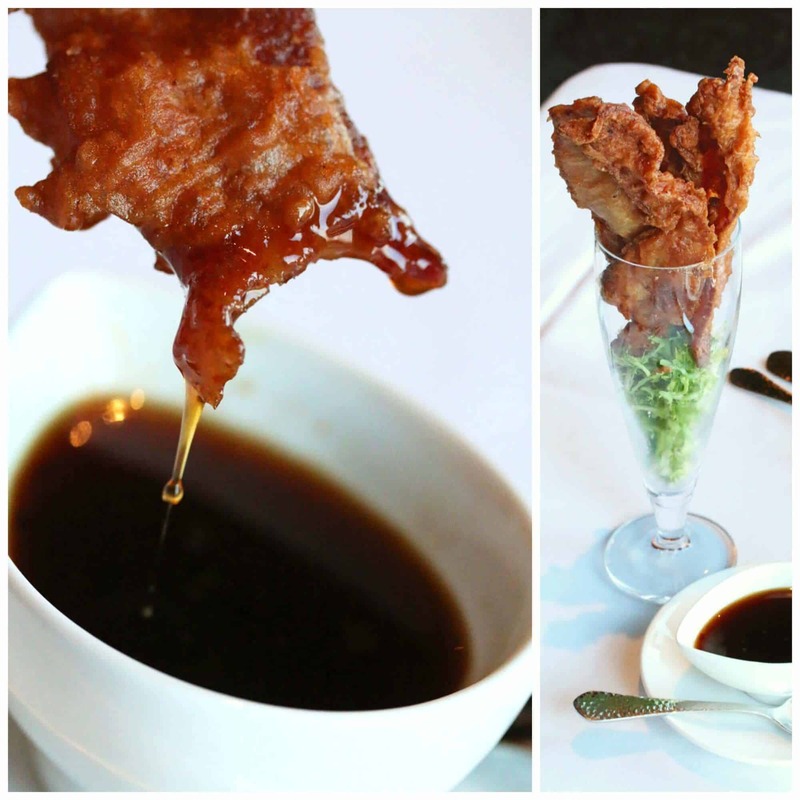 John Howie Steak is one of our most favorite restaurants and YES, that bacon is not to be passed up, it’s amazing!